When housing costs 12 times the average income, making the most of what you have becomes incredibly enticing. The Sydney Morning Herald reported that astonishing ratio for Sydney in late January. Only Hong Kong at 18 times was less affordable, with most cities around the world needing three or four times the take home pay to buy. Hints for helping us renovate come from UK trend forecasters, Scarlet Opus, who at last July’s Decor + Design show in Melbourne, predicted global colour trends that indeed have broken through. For 2017, there are what they call “natural spaces within cities”, enveloped by greenery, with dense, floral textiles or more subdued ones, such as a mossy look. The naturalness of organic matter includes lush greens, in line with Pantone’s 2017 Colour of the Year, Greenery. The yellow-green Pantone’s Spring 2017 Colours also includes Kale, responding to a “stressful and tense world”, says Executive Director of the Pantone Color (sic) Institute, Leatrice Eiseman. The low-key, mineral grey-type Analogue Workshop trend harks back to crafts and slow design, while Blush Tones reflects neutral rusticity, highlighted by subtle pinks. Power Colours adds vibrancy. Scarlet Opus also identified the growing power of women internationally in the bold Tribe trend. Overall, there is also a desire for a digital detox and return to traditionalism. Style and design expert at Cosentino Australia, Niall Galvin, reinforces what’s hot this year, and what’s not. For instance, natural marble for benchtops is out; people do not have the time to properly maintain it, he says. Far better to replicate the look, such as Dekton XGloss Halo, mixing the clean, understated elegance of Scandinavian design, with an earthy Japanese zen influence, all wooden textures and indoor plants. Dekton XGloss Fiord shows subdued grey with green accent colours, a resurgence of granite’s natural beauty alongside functionality. 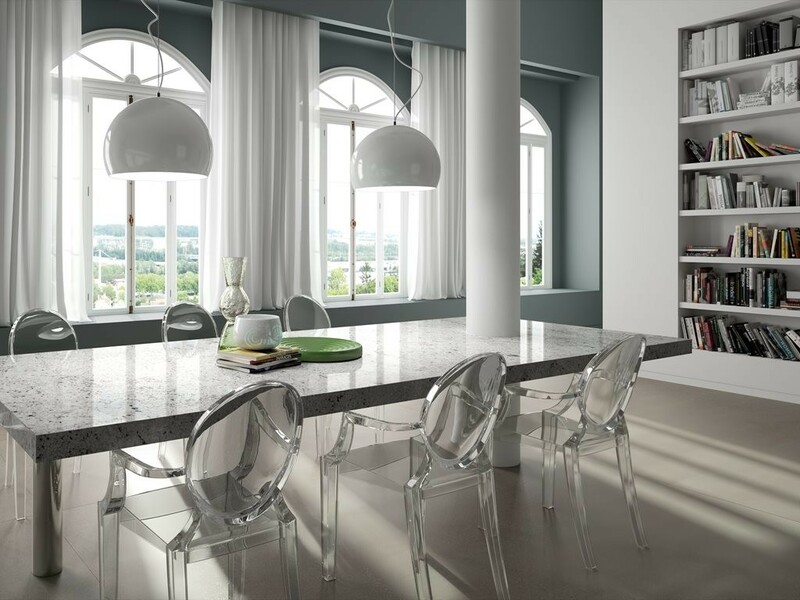 Sensa – Colonial White – Ambiente encourages taking a break from technology, switching off at the power point and in our heads. It also fuses Japanese and Scandinavian designs. In similar vein, greys, neutrals and naturals, and an array of bright, vibrant colours, are part of the more than 500 new colours in the Dulux World of Colour Series II. This marks the first time in a decade Dulux has added to its overall palette of over 4,800 colours. As well as having a major impact on appearance, interiors, especially green ones, can also drive social change within industry and the community. International Green Interior Awards, a platform of Australian Living, asked David Baggs from Global Green Tag, how and why they do this. “Ensuring the health of interiors is a critical component for driving social change because interiors are significantly responsible for how humans actually function and remain healthy,” he says. “As more and more designers to specifiers to consumers make it their business to know what goes into the making of a product, they are taking responsibility for what a supply chain looks like and consciously selecting materials that are accountable for human, animal, cultural, social and environmental health." A patient-focused design philosophy such as at the new Royal Adelaide Hospital, said to be South Australia’s single largest infrastructure project and designed to admit more than 80,000 patients per year, focuses on such matters. Water conservation, energy efficiency and indoor environmental quality, lots of natural light, acoustics minimising noise and disturbance in patient rooms, low volatile organic compound (VOC) paints, and sky gardens, providing enclosed, naturally ventilated spaces aim is to reduce the greenhouse gas emissions by 50 per cent compared with other equivalent hospitals. CSR Gyprock’s EC08 Complete, a low VOC, multifunction plasterboard with impact, fire, acoustic, moisture and mould resistance, was used throughout. Lifestyle journalists in Australia: Roles, Influences and Transformations is a first-of-its-kind journalistic report by University of Vienna academics, Professor Folker Hanusch, and Sandra Banjai and Phoebe Maares. It found that providing fun, entertaining and inspirational stories was far more important than reporting on the industries themselves including monitoring businesses involved in them. Most of the journalists are tertiary educated, not well-paid but are satisfied with their jobs. While there was no specific design category, lifestyle, gardening and property, real estate were covered. The good life indeed!